Home › Earthquakes › Should Japan use Western help in mental healthcare of disaster survivors? Should Japan use Western help in mental healthcare of disaster survivors? Since the disaster in Japan, I have been coming across in the Internet expressions of opinions or recommendations by various Western mental health professionals as to how Japan should go about helping survivors recover from trauma. Most recommendations as to what survivors should do to recover from their trauma are simply reiterations of widely accepted but largely unsubstantiated opinions that characterize much of the current thinking in the field of psychological trauma. I suspect there must be some Western mental health professionals liaising with their Japanese colleagues to offer them guidance in their work. National or international relief agencies may have already recruited foreign care providers to offer direct psychological aid to survivors. All this reminds me of the aftermath of the 1999 earthquakes in Turkey, when many foreign “trauma experts” had rushed to Turkey to “help” survivors with essentially useless treatments. Some offered training to Turkish mental health professionals in psychological debriefing – an essentially ineffective and potentially harmful intervention. Unfortunately, some care providers uncritically used this approach in their work, leading to considerable anger and resentment in many survivors. In addition, many international groups or relief agencies (including some respectable ones) initiated psychological aid projects to deliver other interventions – such as counseling, psychosocial support, psychodynamic treatment, art therapy, play therapy for children among others – none of which have demonstrated usefulness in helping earthquake survivors. Consequently, large amounts of resources were wasted with little or no benefit to survivors. The disaster in Japan will pose a major mental health problem for the country, as I indicated in my previous post. 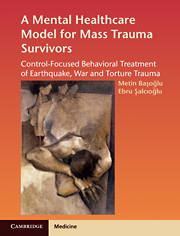 Considering the numbers of survivors likely to need psychological care, effective dealing with this problem requires interventions that are (1) theoretically sound, (2) proven to be effective, (3) brief, (4) easy to train therapists in their delivery, (5) practicable in different cultures, and (6) suitable for dissemination through media other than professional therapists, such as lay people, self-help tools, and mass media. Western treatments do not meet more than two or three of these requirements. Very few treatments are demonstrated to be useful. Among these, cognitive-behavioral treatment (CBT) is widely regarded as the treatment of choice in posttraumatic stress disorder (PTSD). Cognitive therapy is based on the understanding that anxiety is caused by faulty forms of thinking about the trauma and one’s role in the trauma (e.g. I brought it upon myself) and that correcting such faulty thinking reduces anxiety. Behavioral treatment, on the other hand, is based on the principle that prolonged exposure to feared situations leads to a reduction in anxiety. [A dog phobia, for example, is treated by gradually exposing the person to the presence of a dog until fear diminishes.] The mechanisms by which CBT reduces traumatic stress are yet unclear. Although some believe that correcting faulty forms of thinking (namely, cognitive structuring) reduces anxiety, there is evidence (including our own work) to show that this is not essential for recovery. Furthermore, the applicability or usefulness of this technique in non-Western cultures is not yet certain. Eye Movement Desensitization and Reprocessing (EMDR), on the other hand, involves getting the survivor to follow with their eyes the movements of the therapist’s finger moving from side to side, while also mentally focusing on trauma memories. The eye movements presumably reduce the distressing effects of trauma memories through a yet unexplained mechanism. While EMDR was launched almost as a miracle treatment for PTSD, later studies have shown that eye movements are not essential for improvement. The reported therapeutic effect of this intervention is possibly due to getting the person mentally to focus on trauma memories, which is essentially a well-known behavioral intervention (imaginal exposure) that has only limited usefulness in reducing distress associated with trauma memories. Thus, EMDR is no more than an old intervention re-packaged and marketed for primarily commercial purposes. A sound theoretical orientation in psychotherapy is essential for right choice of treatment. Sorely lacking among many care providers is an awareness of the fact that an intervention is likely to be effective to the extent that its mechanisms of action match the causal processes that underlie traumatic stress reactions. Evidence shows that the causal process in traumatic stress is fear-induced helplessness arising from repeated exposures to unpredictable and uncontrollable stressor events. Thus, to be effective, a treatment needs to reduce helplessness by helping a survivor regain sense of control over anxiety or the anxiety-evoking stressor event itself. To use an analogy, bacterial infections require treatment with antibiotics, because antibiotics specifically act on the causal agent. Any intervention without a sharp focus on the causal process in traumatic stress is likely to yield no improvement or at best only partial and modest effects. Helplessness responses are particularly striking in earthquake survivors, because earthquakes are among the most unpredictable and uncontrollable disasters. Indeed, anyone with some experience with earthquake survivors would know that fear-induced stress symptoms are often the most prominent features of traumatic stress, particularly during the period of ongoing aftershocks. Yet, most treatments do not have sufficiently sharp focus on trauma-induced fear as the primary causal process. Consequently, they have partial effects at best, leaving behind substantial amount of unresolved problems. Our studies show that helping survivors regain sense of control over fear achieves more substantial and lasting improvement in traumatic stress. Current trauma treatments have other limitations in post-disaster circumstances. CBT requires an average of 15 weekly sessions to deliver, whereas EMDR is delivered in about 4 sessions. No country – not even Japan – has that many therapists (or the resources) to deliver these treatments to tens or perhaps hundreds of thousands of traumatized survivors. Furthermore, high demographic mobility after disasters and day-to-day survival problems make regular treatment attendance difficult, if not impossible, for many survivors. Because these treatments involve elaborate procedures that heavily rely on therapist skills, they are not suitable for wide dissemination as self-administered interventions. In view of the relatively strong biological orientation of Japanese psychiatry, I suspect many Japanese mental health professionals will be inclined to use various medications (e.g. antidepressants) in treating survivors. Pharmacological treatment does not offer much prospect in dealing with the psychological aftermath of the disaster, as drugs yield only limited effects, which disappear when the drug is discontinued. Furthermore, our work shows that antidepressants, when used together with an effective behavioral treatment, do not confer additional benefit in treating earthquake survivors. So, Japanese psychiatrists will need to consider effective psychological interventions in their search for long-term solutions to the mental health problems they will be facing. Also important is the fact that most trauma treatments– including psychiatric medications – are a product of western traditional medical model, which is essentially based on a puritanistic view of anxiety as a phenomenon that needs to be eradicated at all costs. Anxiety reduction by any means is neither possible nor necessary in circumstances where people face realistic threats to their safety. This implies that interventions aiming for anxiety reduction are not likely to have potent or lasting therapeutic effects and evidence indeed supports this point. Furthermore, anxiety reduction by drugs, psychotherapy or any other means is not necessarily conducive to resilience, if resilience is defined as ability to tolerate and maintain sense of control over anxiety, avoid helplessness, and not allow anxiety disrupt life functioning. The traditional Western ‘anti-anxiety’ care model has not amounted to much more than numerous institutionalized forms of psychotherapy with dubious or limited usefulness and a lucrative multi-billion dollar pharmaceutical industry that has little to offer in promoting resilience. There is clearly a need for an alternative mental health care model for traumatic stress, as well as stress in general. I believe the answer lies in the millennia-old cultures of non-western societies. Resilience-building through exposure to anxiety or distress is not a novel concept, given the many examples of this process in eastern philosophical thinking. For example, Buddhist training (or life style) involves elements of exposure to austere conditions and actively promotes mental control and / or tolerance of suffering. Such resilience training might well explain findings of low traumatic stress rates in Tibetan monks subjected to torture. This concept of resilience-building is not alien to Japanese culture and if mental health professionals can channel it into effective psychosocial interventions, while steering clear of anxiety-reduction approach, they would stand a better chance of success in dealing with the psychological aftermath of the disaster. Japan is said to be reluctant in accepting aid from western countries in the aftermath of major disasters. I do not know the reasons for this and whether it also applies to foreign assistance in survivor care. In any event, it would be in Japan’s interest to exercise caution in uncritically importing Western treatment concepts and modalities. Having said this, I should also add that the current state of knowledge in survivor care in Japan does not appear to be more advanced than anywhere else. A biological or pharmacological approach is not likely to be of much help in addressing this public health problem. In my view, Japan needs to place more emphasis on effective psychosocial interventions in survivor care – an area in which it seems to be lagging behind. If Japan is agreeable to outside help for care of survivors, a governmental policy well worth considering is the establishment of a national advisory body that reviews and vets all proposals for psychosocial aid projects for survivors and also coordinates and monitors them. Such projects need to be assessed as to whether the proposed work is evidence-based and practicable in the particular cultural and post-disaster circumstances of the country. Organizations funding relief efforts also play a major role in persistent use of ineffective treatments by supporting psychosocial aid projects without a critical review of their potential usefulness. These organizations need to be aware of the fact that their money stands a good chance of being wasted on potentially useless projects. At the very least, they could consider making their funding support conditional on two requirements to avoid wasting their resources: (1) previous evidence of treatment efficacy published in respectable professional journals and (2) evaluation of treatment outcome early in the life of the project as preliminary evidence of potential usefulness of the treatment program in a particular post-disaster setting. And last but not least, people with health problems have a right to receive effective care and governments as well as health professionals and other organizations concerned with survivor care have a moral obligation to observe this basic human right.